With a light, sweet taste of strawberries and banana, this gelatin is just like mom used to make - except it's protein gelatin! 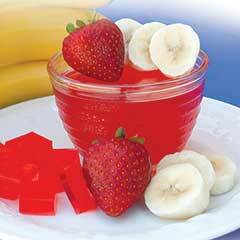 Please Note: ITG Banana Strawberry Gelatin is made from collagen, which is very good for anti-aging and skin. However, it is not considered a complete protein because it does not contain all essential amino acids. We suggest you have one packet every other day as one of your 3 ITG Protein Foods for the day. Or, add as a 4th item for the day if hungry.